I was very fortunate to have attended AWP in Boston this year. Most of my time was spent at the book fair where I, and fellow MFA candidates, promoted our program’s literary journal, The McNeese Review. We were surrounded by very good company, but there was one literary magazine in particular which caught my attention. I was so intrigued and impressed by the premise of HOOT that I invited the editors here for a brief chat, and they very kindly agreed. NICHE: How did HOOT (a postcard of [mini] poetry and prose) come about? AMANDA VACHARAT: The first time I went to AWP, a small magazine was having a contest for short fiction, the winner of which would be printed on promotional postcards for the magazine. I just loved the idea of having writing published on such a tangible medium that I wanted it to be a monthly occurrence! And with illustration! But it wasn’t until two years later, when Dorian provided the fire to get it off the ground. NICHE: Why the decision to do mini? AMANDA VACHARAT: Well– the spiel we give usually references the internet– mini/brief goes so well with the way we read things online. Brevity fits into our lives, and it’s also shareable. But basically, it’s because we like mini stories and poems! There’s less room for pretension within only 150 words. NICHE: Tell us a little bit about who is involved in this endeavor, and what individual roles you all (Dorian Geisler, Amanda Vacharat, Jane-Rebecca Cannarella, Joseph A.Thompson, and Zana Bass) play to make a monthly magazine happen? DORIAN GEISLER: Good question. It is a little more like making something happen than simply making a thing–It’s not just art, but art that goes out to people in their mailboxes! Joseph Thompson is in charge of the pen pal program (see below) and so doesn’t have much of a hand in the monthly running of the magazine itself. Zana Bass is a guest editor, guest artist, and just general guest–we are glad to have her work with us when she is able, but, as you can gather, she, too, is not involved consistently with the production of the magazine itself. Selecting the piece of writing. Amanda, Jaine, and I all collaborate closely to choose the piece we want to publish for the postcard. Writing the seasonal notes on the backs of the postcards, adding stamps and addresses, and sending them out. This again, Jaine, Amanda, and I do together. NICHE: Tell me a little about how you go about matching artwork with stories? Who is the primary artist? Will HOOT be asking guest artists to contribute artwork in the future? AMANDA VACHARAT: Except for our online issues, we don’t actually match artwork with stories–we actually create (or have the artwork created) in response to the story/poem. Something we try to do is go beyond a basic “illustration” of what is already written – we try to give the writing an extra layer of tone, or the story another dimension. Up until now, we’ve had a few guests, but I have done the majority of the illustrations…but we’re really trying to move away from that model (and are actively looking for illustrations), and in fact the next few issues are “guest” artists. NICHE: Tell me a little bit about the free workshops, including the Pen Pal Workshops that HOOT offers. DORIAN GEISLER: The free workshops that we offer occasionally throughout Philadelphia are how-to’s on writing very short fiction, or else on creating art to accompany pieces of writing. The Pen Pal Workshops are run by Joseph Thompson. Without getting too technical, the idea is for writers across the nation to share brief pieces of writing through the mail, and to receive feedback on them. We also offer a free online writing workshop, every other Wednesday evening, which is held in a chatroom accessible from our website. We workshop very short pieces, fiction and poetry, and we cater to whoever shows up. It’s a little rushed, and a little erratic, but it is also fun and (usually) helpful for the writers. NICHE: How does HOOT go about accepting submissions? Are there a certain things that HOOT looks for, or aesthetic that HOOT ascribes to? AMANDA VACHARAT: We accept submissions both online and via snail mail. Snail mail submissions are free (but require a SASE) and there is an online fee of $2 — this goes towards paying our author. We read every submission out loud, to make sure we give it ample time and attention, and we often give the authors some feedback with our response. There’s not really an aesthetic- though we do keep the Refrigerator Rule in mind–many of our subscribers hang the postcards on their fridge or above their office desk, where they (and their family/co-workers) will look at them all month long…we try to publish pieces that won’t be offensive in those locations. NICHE: Who has HOOT published? AMANDA VACHARAT: We’ve published a wide range of people– there are authors who have published books, or who have started presses, but a good number of our issues are first time publications. I think because of the short format, it’s a welcome place for both experienced and hesitant writers. NICHE: Where can readers buy HOOT? How much do you charge for each postcard? How much does Hoot charge for subscription? AMANDA VACHARAT: There are a few stores in the Philadelphia area, but really we do our business via our website. A subscription is $14 (but that’s soon to go up to $15 due to increased postage), single postcards are $2 and can be either mailed to you blank (so you can send it) or sent to an address with a personalized message written on the back. NICHE: What’s next for HOOT? DORIAN GEISLER: Another great question. I remember when we were just getting started, or had just a few issues out, and people would always say to us, “That’s a great idea for a magazine.” While that’s complimentary (and understandable), that comment started to grate on me after awhile. Nowadays people can look at our issues and (hopefully) say simply, “That’s a great magazine.” Which–brings me to the actual answer to your question! We don’t want HOOT to simply be a clever idea that came, was a cool novelty for a while, and then disappeared. Right now, we’re focusing on sustainability. We’re trying to develop habits, routines, networks, and skills that will enable HOOT to stay around for a long time. What’s next for HOOT? Hopefully many years of respectable sustainability. NICHE: Is there anything else about HOOT that you want our readers to know? DORIAN GEISLER: Well, one thing is that HOOT is a very small magazine. Not only is the basic print issue very small (it is, of course, only a postcard), but our staff is small and our subscriber list . . . is relatively small compared to more well known, long-standing and traditional literary magazines. Part of working with HOOT, for me, is embracing this humbly. Part of the reason I think HOOT works is that it is humble. The writing is not presumptuous. We’re not presumptuous. We’re trying to send the signal that small, humble projects like a postcard magazine can succeed, even if that success is small and humble. Ideally we’re trying to send the signal: Something can be worth doing, even if it’s small and humble. 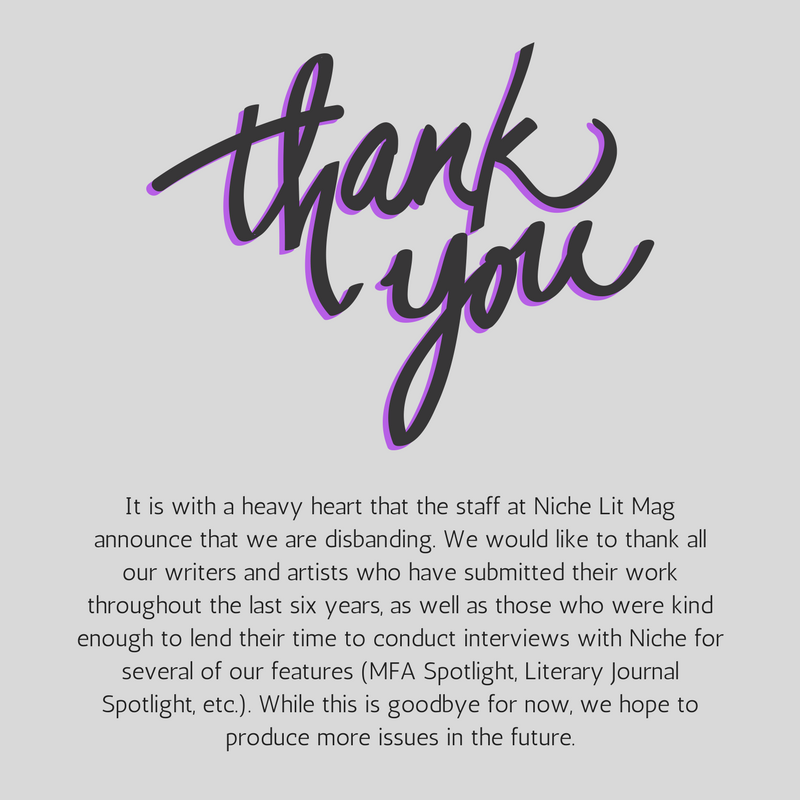 This Literary Journal Spotlight was originally published on Niche’s website on April 8th, 2013.